Join because Delta Zeta is amazing! We tend to be the kind of women who help others. We expect to demonstrate that a group of women with shared values can create opportunities for other women. And through our membership experience, that any woman will find herself able to begin living her dreams, right now! Join us because relationships matter! We work to keep our membership experience relevant and people centered. There’s a whole lot of “telling others what to do” in some organizational models, but we’ve been listening to our women. They want more “showing”. That means our advisors become more mentor-like. We develop the collegiate woman’s leadership skills by coming alongside her in service. Our chapter officers lead through a spirit of doing things together. It’s natural, but it has to be practiced. It becomes intuitive, but we have to model it. Join us because we’re really good neighbors! 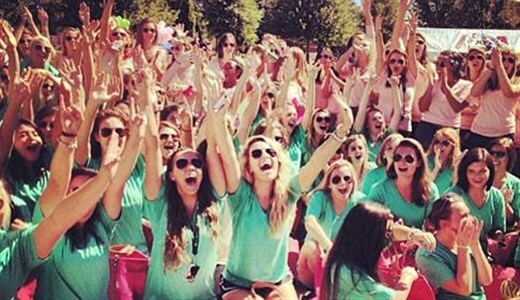 Sorority exists to enrich the collegiate experience. We do this in community with others. Our strong ties to the campus include shared scholarships and local engagement in philanthropy and service projects across a wide spectrum of worthwhile causes. We believe in big ideas and that includes helping others with theirs. Our being neighborly extends beyond the campus map across the entire world through our national philanthropy partner. We’re good neighbors here to make life better for the one’s we know best. We’re good neighbors around the world so the world may hear. Join us because we’re here to make something of ourselves! We’re students first. Scholastic achievements are an important part of our success formula. Our focus on academic success is the very foundation upon which we build a chapter and it’s a requirement for membership. Demonstrating success in the classroom has proven to be a key indicator of a member’s citizenship. We think about it when we start a new chapter. We think about it when we choose new members. Join us because you expect to Be More! We become better people through learning and through relationships with others. The Being MORE experience is a four year program – peer led, and developed in partnership with a women’s leadership organization. We help our members develop the life-skills that will help them get the most from their Sorority and life experience.